You’ve certainly come to the right place if you’re looking for something completely different! The Berry Floral Chalkboard wedding bundle features a unique black background speckled with pretty little floral illustrations and finished with gorgeous gems and pearls for an extra special touch. This invitation from Norma & Dorothy has been designed with a chic, on-trend wedding in mind and is sure to get your guests in a celebratory mood! The chalkboard-effect background of the wedding invitation and the eclectic typefaces create a fun, laid back look whilst the colourful berry tones and rustic wood add warmth and charm to this characterful bundle. Complete with wedding invitation, RSVP tag (with returning envelopes!) and coordinating bellyband, you can rest assured that everything will be sent out to your guests in a suitably organised fashion. 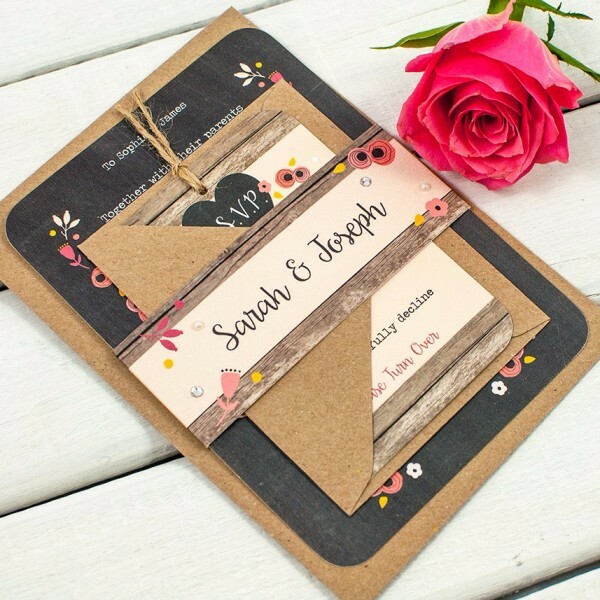 Each item boasts the characteristic floral designs and complimenting background colours, making this design look every inch a bespoke set, especially with its rustic craft colour envelopes! The fabulousness doesn’t end there though, because the belly band is carefully hand finished with beautiful gems and pearls for a subtle ‘Wow’ factor and the RSVP tag card boasts a length of hand tied twine for a natural, rustic finish. For all things sweet and rosy with a splash of quirkiness and playfulness encompassed in a chic and stylish bespoke-looking design, the Berry Floral Chalkboard wedding bundle really is the choice for your upcoming wedding! Tags: Bespoke, Chalk, Chic, Diamante, Eclectic, Pearl, Rustic.